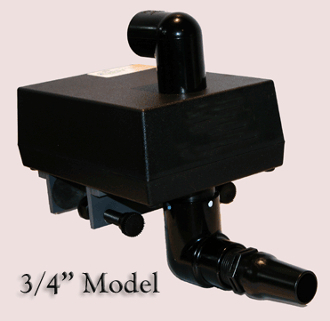 OUR 3/4" MODEL WILL FLOW APPROXIMATELY 850/950 GPH MAX. THE TOTAL HEIGHT WITH FITTING ATTACHED ON TOP IS 4 1/2". Standard bracket assembly supplied fit's glass tanks with tank frame width of 1-5/8" max. We can SUBSTITUTE a EURO bracing/ACRYLIC TOP bracket FOR AN EXTRA $19.00 CHARGE. See Drop Down Box! Units are supplied with a BLACK fpt x fpt inlet(for hard pvc plumbing) with the optional barb fitting included for hose connections. Inlets are ADJUSTABLE for easier installation of incoming water supply. FREE UPS GROUND OR PRIORITY MAIL SHIPPING IN THE CONTINENTAL US! CANADA & INTERNATIONAL ORDERS WILL RECEIVE DISCOUNTED SHIPPING.